The week leading up to the walk was filled with emails, phone calls and group chats. Those of us who were at our donation goals were helping others to meet their individual goal. Friends and families, colleagues and even strangers sponsored us. We all reminded sponsors that 100% of their donation would benefit Princess Margaret cancer research. We were all apprehensive and some even doubted our physical ability to walk the 60km. Some of my teammates had trained extensively, and others not at all. Every one of us monitored the weather forecast praying for dry and cool weather. Costumes were coordinated, Wonder Woman attire assembled. Our excitement grew each day. I doubt any of us slept well the night before the walk. I lay in bed listening to the thunder and watched the lightning from my bedroom window. The heavens opened up to unleash a wicked storm. I prayed that it would end before we began our walk Saturday morning. Arriving at Rogers Center we checked our gear and bags and we listened to the opening ceremonies. I was incredibly emotional as I joined hands with my team and thanked each of them for what we were about to do. Then we began to walk. It had stopped raining! My eyes teared up every time I read a “in memory of” shirt proudly worn by a fellow walker. T-shirts with pictures of their lost loved ones, their spouse, their mother, their grandmother, their child. Everyone walking had been affected by cancer. Almost 3000 walkers surrounded us day one and over 700 day two. Those of us with a pink lanyard were survivors and walkers wore blue. As we walked the distinct neighbourhoods of Toronto we were met with Indian dancers on Gerard, Chinese dragon dancers in Chinatown, steel drum players, bands, singers, belly dancers, all cultural representations of our great city. We were welcomed by community lemonade stands, kids handing out treats and water, and a woman sprayed us with sunscreen in High-Park. Then there was the “weekend crew”, who made every traffic light memorable. Paul, in particular, a passionate volunteer would quote Nelson Mandela or other inspirational speeches as we stretched our legs, listening to his words we would feel a surge of pride and emotion as he reminded us that we were indeed making a difference. The light would then turn green and off we walked. Blisters, rashes, sore joints, chafing, sore feet yet the team kept going. When you are walking to raise money for cancer these minor irritants become insignificant. Helping someone to avoid chemo, radiation and invasive surgery is why we walked. 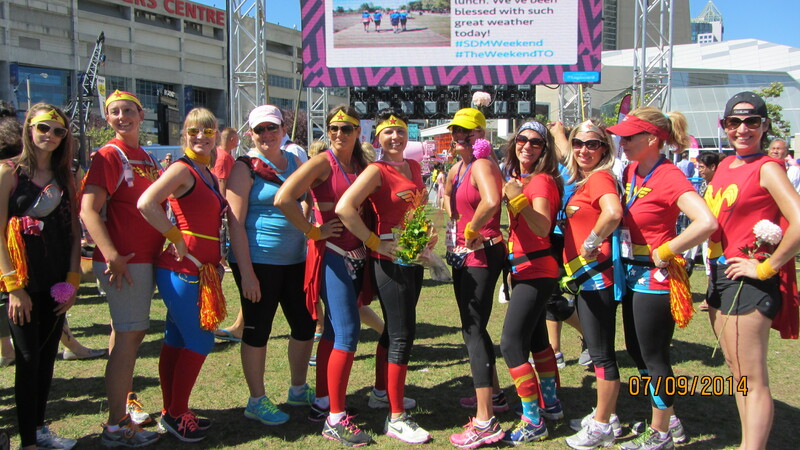 As Team Wonder Women passed pedestrians we would see smiles on their face. We would hear cheers “Go Super Girls” – “Go Wonder Women” –“great costumes.” It pumped us up and we felt like super heroes for that moment. I feel loved and I am so lucky and fortunate to be able to have walked with my beautiful friends who shared this weekend with me. Some I have known from the age of 15 and others I met in my 40’s. I love them all. We reminisced as we walked through parts of the city where we had old apartments or houses, where we got married, where we danced and drank too much, where we mended a broken heart, and where we had our babies. I felt like this weekend represented my life, my history, my youth, my young adulthood, motherhood, my marriages, and my diagnosis and treatment. I am so proud of team Wonder Women and all our sponsors and most of all I am happy to be alive.